To the casual eye, Cape Refuge is just an island in the waters off Savannah, Georgia. Look a little deeper though, and you'll discover a closely knit community with stories to tell - and secrets to hide. Bestselling novelist Terri Blackstock weaves two fast-paces tales of suspense and faith that will keep you turning the pages long past midnight. 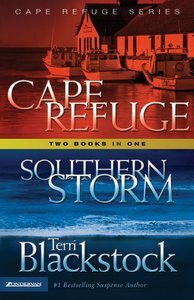 About "Cape Refuge/Southern Storm (2 Books in 1) (Cape Refuge Series)"
Set in the South, volumes one and two from the Cape Refuge suspense series by Terri Blackstock come together under one cover. A unique island setting, close-knit relationships, fast-paced action, and underlying themes of faith combine to make for reading you can't put down at a value you can't turn down.